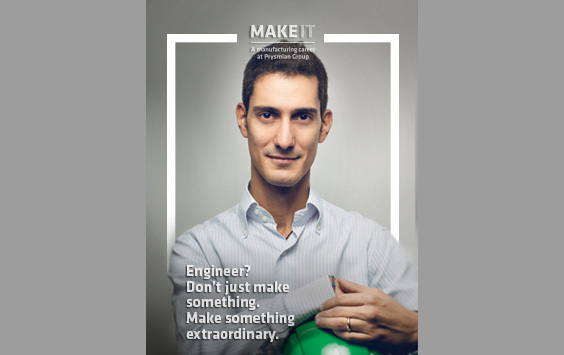 Prysmian Group launches “Make it”, the recruitment programme for engineeers with plant experience. The Group is dedicating over €160 million to industrial investments and focusing on the growth of highly qualified personnel. Prysmian Group, world leader in the energy and telecom cable systems industry, is launching the “Make it” recruitment programme, aimed at engineers and technical staff with manufacturing experience. It is seeking process, maintenance, design and quality engineers, as well as other technical specialists, to cover key roles in the manufacturing area in one of the company’s centres of excellence located throughout the world. The profiles required include a degree in engineering, or equivalent, and 3/5 years work experience obtained in similar positions in a previous professional context, a good command of English and leadership qualities. The Group is aiming to identify and develop the manufacturing sector’s best talents, offering them the opportunity to make full use of their skills and expertise. Through a four-year professional pathway, “Make it” offers a top training scheme involving the Prysmian Group Academy, which will focus on further developing the skills essential for the career of the candidates selected. The programme will include two weeks training in the Milan headquarters and two weeks in the new Manufacturing Academy in Mudanya (Turkey), a specialist centre that is due to be inaugurated in January 2016 in one of the Group’s major plants and will allow highly specialised personnel to be trained. With 89 plants and various centres of excellence distributed throughout 33 countries, Prysmian Group represents an organisation committed to ongoing industrial investment – amounting to €163 million in 2014 — which makes it a world leader in its sector, particularly in key submarine cable and optical fibre segments. In recent years, the Group announced major industrial investments in various parts of the world: new plants in Romania to triple optical cable production by 2020 and introduce the production of high voltage submarine cables, the opening of a new telecommunication cable plant in Mexico for the production of 2,000,000Fkm a year, the expansion of the Brazilian sites for the production of optical fibres and SURF products for the oil industry, the increase in production capacities for submarine cables in Italy and Finland and the opening of a new factory in Russia for the production of power transmission and distribution cables. Prysmian Group is world leader in the energy and telecom cables and systems industry. With more than 130 years of experience, sales of nearly €7 billion in 2014, some 19,000 employees across 50 countries and 89 plants, the Group is strongly positioned in high-tech markets and offers the widest possible range of products, services, technologies and know-how. It operates in the business of underground and submarine cables and systems for power transmission and distribution, of special cables for applications in many different industries and of medium and low voltage cables for the construction and infrastructure sectors. For the telecommunications industry, the Group manufactures cables and accessories for voice, video and data transmission, offering a comprehensive range of optical fibres, optical and copper cables and connectivity systems. Prysmian is a public company, listed on the Italian Stock Exchange in the FTSE MIB index.